Wet tracks, dry tracks – it doesn’t matter to Danny Williams’ bonny filly She Knows. 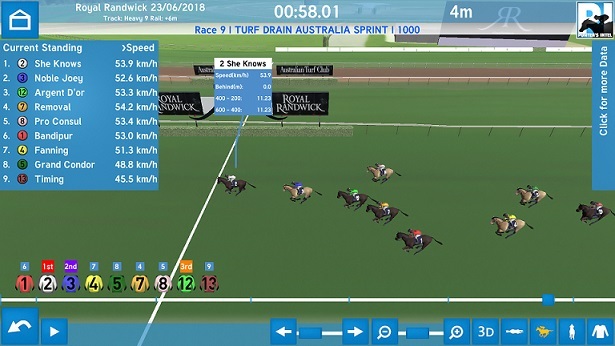 The talented three-year-old has made the transition from Highway racing look easy and Punters Intel data shows she was responsible for the fastest last 600m of the day in her 1000m scamper. Sure, you’re going to run fast times in a 1000m sprint but only two horses all day broke 35 seconds for the their final 600m (Argent D’Or 34.94 running third in the same race was the other). It’s tough to run down any horse that hits the front before the 200m then reels off the quickest last 200m of the race as She Knows did. But, not only was 12.24 the fastest last 200m she ran a pair of 11.23s to the 200m which were easily the quickest of those splits too. She’s flying and she can be relied upon to produce, wet or dry, particularly in the short course sprints. The designated ‘flashing light’ from Royal Randwick on Saturday was the Snowden three-year-old Island Missile, who ran a closing fourth first-up from a spell in the 1200m Dad & Dave’s Turf Handicap. He spotted the leaders some 15m racing in last place around the 800m and produced the fastest last 600m of the race in 35.19 to be on their heels. His 11.31 from the 400m-200m was also the quickest and he ran home in 12 seconds flat. He was stakes placed last preparation and bumped into a couple of smart ones so his record could be better than it is, and Saturday was his first try on a wet track so he could be in for a lucrative winter. The Elite Haulage Handicap over the 1200m was run in faster time than the three-year-old event and that’s no surprise when you have Jungle Edge scooting along up front. He didn’t seem to overdo it once he found the lead, his first 200m of 13.47 was far slicker than any other, running 11.09 and 11.27 in the middle stages. When he won the June Stakes two weeks earlier he was running sub-11 seconds midrace and perhaps he was rated a bit too well on this occasion. The winner I Thought So finished the race off in 35.44, which was the fastest of the race, but it was the third placed Faraway Town who produced the best final 200m of 12.38. If she strikes a slightly firmer track in the Civic Stakes this Saturday, which is likely, she could take plenty of holding out. At Newcastle on Saturday, a two-year-old gelding called Hubble, trained by Kristen Buchanan, signalled she has ability with a slashing second placing in a 900m dash against older horses. Granted he started $31 but this is all about the sectionals and, after conceding the leader 16m at the 500m (of a 900m race), he flew home in 33.97 with the 400m-200m in 11.10 and the last 200m in 12.02, each comfortably the quickest for their respective splits. No knock on the winner Crackneck, a three-year-old who ran 34.23 (last 600m), but it’ll be interesting to see what Hubble can produce next time. Watch Punters Intel with Gerard Middleton, Brad Davidson and Brad Gray at 7pm every Tuesday on Sky Thoroughbred Central.